When it come to Guitar Hero 6 I don't think most of the people picking it up are going to be trying to find a revolutionary new title that shakes things up. Rather, they want more of the same gameplay that has stayed with the franchise since its inception. One that that will be different, however, is the set list. That has always got fans in a bunch worrying about what will show up next. 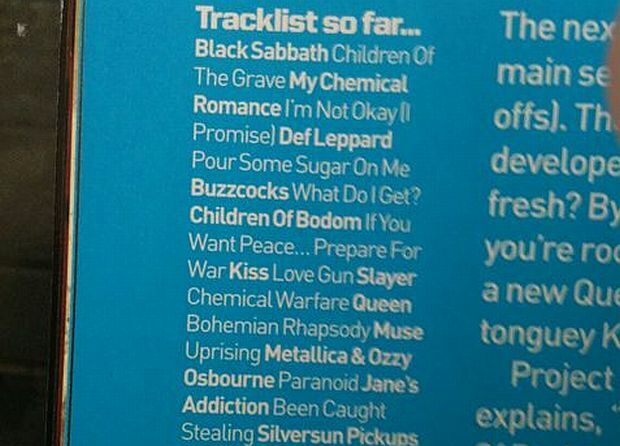 Apparently The Official Playstation Magazine UK has printed a partial set list for the upcoming Guitar Hero title. Considering this is the internet, this was promptly scanned and placed online. With bands such as Children of Bodum, AFI, Black Sabbath, My Chemical Romance, Slayer, Ozzie, and The Cure metal, goth and emo music are pretty well covered. Thankfully, bands such as ZZ Top, Muse, Silversun Pickups and Queen round thing out in this initial list. Overall, it's nothing to not be expected. For track titles and full list, follow the jump. However, I want to make special note on the inclusion of "Bohemian Rhapsody" by Queen. A rock standard, gamers have been begging for this song to show up in a game for a long time. What do you think? Does this look good for the upcoming Guitar Hero 6? Is there anything in particular that stands out to you?